Skin conditions such as eczema can be challenging, not just for you but for the people you are with. If you are going away to an unfamiliar environment and perhaps a different climate, your trip could bring on allergies, eczema or other irritants. However, if you take the right precautions, there’s no reason why you shouldn’t enjoy your holidays as much as anyone else. Before you go, ask your doctor for advice or medications such as topical steroids to help keep your eczema at bay should you have a flare up while you are away. Take extra moisturiser and other ointments with you. Different climates can bring on problems such as uncomfortable, cracked or flaky skin which can lead to serious infections. Bleach, detergents and dust mites often trigger allergies and eczema. If you pack your own anti-allergy sheet with dust mite protection, you could avoid an unnecessary flare-up. If you are travelling to an EEA country or Switzerland, make sure you get a European Health Insurance Card (EHIC) to cover you for emergency medical treatment while you are away. Bear in mind, however that this free card does not cover other things like repatriation, loss or theft of baggage and 24 hour medical assistance. A good travel insurance policy is therefore a must. As with all medical complaints, it is important to let your insurers know if you have eczema, along with any other pre-existing medical condition(s) you may have. If you fail to do so, your policy will be invalid and any claim you make may be denied. Keep drinking – non-alcoholic drinks of course. Ideally water and fruit juices are best. Travel can make you a little more stressed than usual and is dehydrating, so remember to keep your fluid levels up at all times. Dress in cotton or linen loose fitting clothing to avoid irritating your skin with rubbing from sitting down or walking for long periods of time. Avoid wool and synthetics as much as possible. Extreme temperature can give rise to flare ups, so remember your hat and gloves in winter and cool clothing in summer. 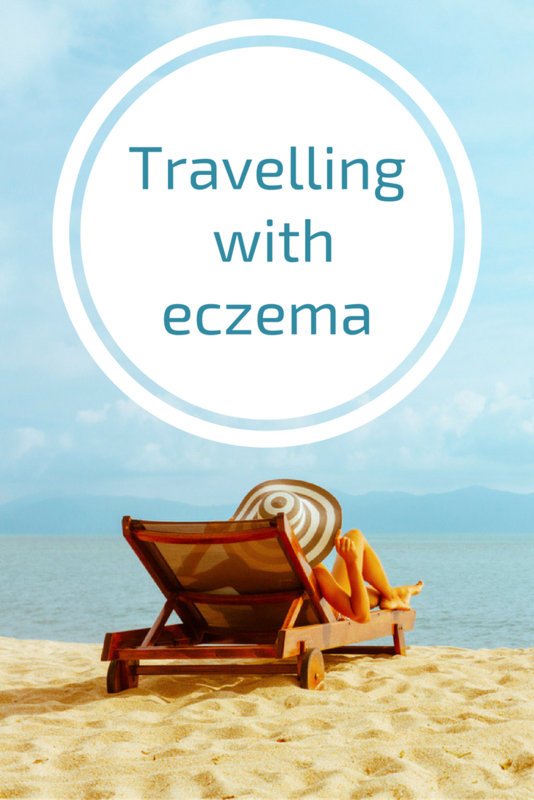 These tips are non-advisery and are merely meant as a general guide to avoiding problems when you go on holiday with eczema. For professional advice, please consult your doctor.